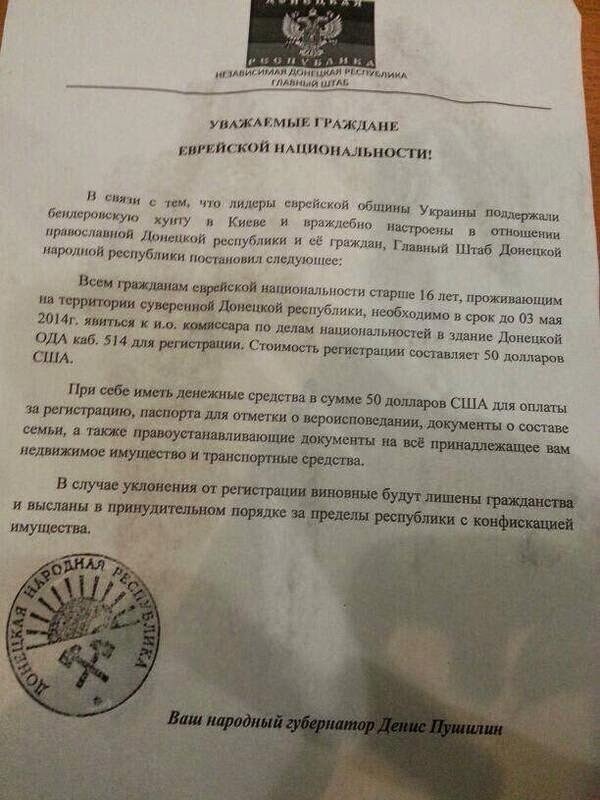 Jews Ordered To Register Religion And Property In Donetsk, Ukraine — False Flag? According to YNet, a leaflet was handed to Jews in Donetsk, Ukraine, ordering them to register their religion and property or be deported. The claim is that this came from the pro-Russian faction in Donetsk, but that allegation has been vehemently denied by Russia. Fear replaced communal atmosphere in Donetsk’s Jewish community as armed men handed out a leaflet Passover eve calling on Jews register their religion and property with the interim pro-Russian government or face deportation and loss of citizenship. The role of Right Sector in post-revolution Ukraine was exploited by Russia to justify its intervention in Crimea, arguing that Kiev had been taken over by fascists and neo-Nazis. Russian president Vladimir Putin said the Maidan uprising had been hijacked by Jew-haters and Nazi sympathisers. UPDATE: Pushilin has denied the Novosti Donbassa’s report and assured reporters that the flyer is not from his organisation.